So, as I am sure many of my followers are aware, there has been some recent and, in my opinion, unnecessary drama on here this evening over one particular painting. I am not someone who enjoys conflict or drama, so as a result of all this, I have decided to remove the painting that is the cause of all this. However, I would like to make it VERY clear that I am NOT removing anything because of threats or insults I have received via private messages. I am removing it because I CHOOSE to. Not because someone tried, rather rudely, to force my hand. I would also like to point out that by removing this piece of artwork, I am NOT admitting/agreeing to the accusations that it has been copied by another artist. In fact, I have supplied quite a large amount of evidence to prove that this is my own, ORIGINAL artwork; including things such as screenshots and real time photos. But quite clearly, none of this has been enough for some people. So, my decision to delete this piece is simply due to the fact that I do not want my page, or my work, surrounded with negativity, and also I wish to show that I am a truthful, and very reasonable person. I am a hard working artist, and I really enjoy what I do. 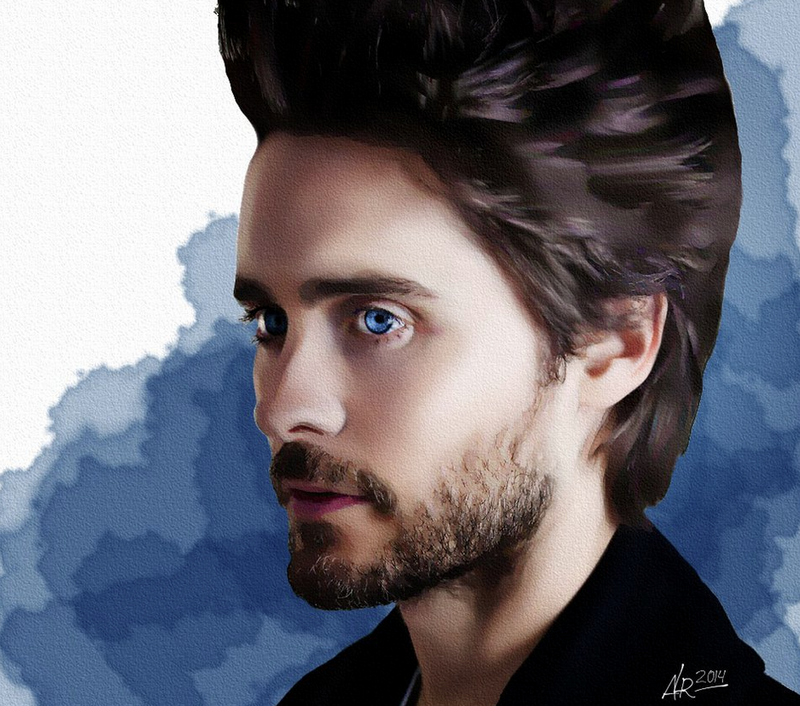 Originality is important to me, and I take pride in what I do. So I refuse to be deterred by any of this. People that have questions, or further disputes about any of this they know where to find my inbox. Or comment, because I really do prefer to air things out in the open. I have nothing to hide. Hi there, I do not wish to start a drama or anything but I am truly flattered that you believed my work worth photoshopping and passing off as your own. 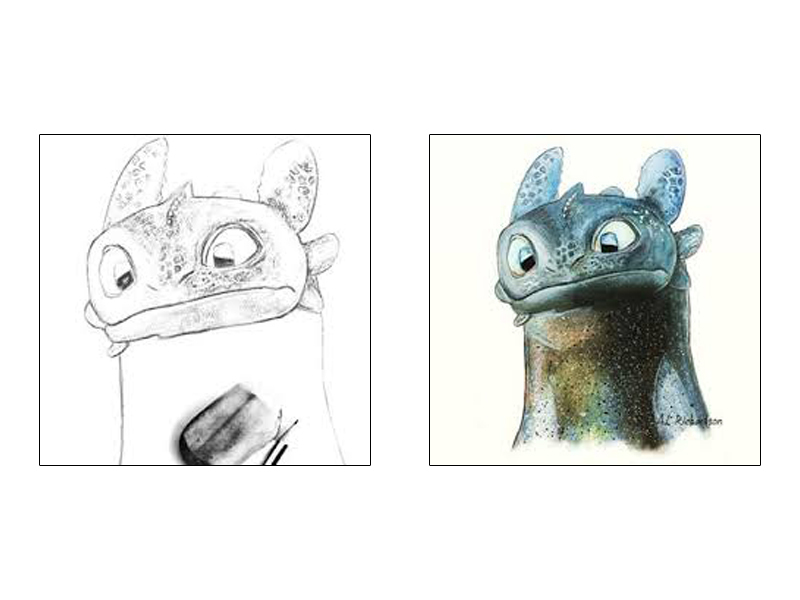 Photoshopping a fake ‘sketch’ of Toothless is amusing as I do not tend to sketch before I paint as seen in these work-in-progress picture I have attached. Know that if this post is concealed, deleted or prevented in anyway I shall spread you as a fraud far and wide. The internet is a wonderful thing as no claim/picture/post is truly deleted. I honestly hope to see your true skill one day, though if this case is anything to judge by I will find it hard to believe them as yours. Though theft of artwork and for people to claim it to be one’s own is certainly not unheard of, when it is personal it hits like a stupefying hammer of contempt. One such fraud calling herself ‘foxyartisan’ decided to steal one of my artworks and then claim it as her own. True to my threat above, as this individual decided to actively delete her Instagram, Facebook and Redbubble accounts I find it within my right to expose this thief. If you think removing yourself from the internet will solve your problems or quash any retribution you are very much mistaken. The internet is a wonderful thing and is not a safe venue for deception or fraud or attempting to profit from other people’s work as they will never go unanswered. Contrary to what I said above I am absolutely livid that someone would have the audacity to steal my work, edit it and then pass it off as their own. I had been alerted by another artist who you also stole artwork from, but in her case not only did you steal, you then had the nerve to sell her work on Redbubble and I find that utterly abhorrent. Even bypassing the lack of respect and courtesy what you have done is illegal. Though I usually would not waste my time proving something that I know full well is genuinely mine, in this case I thought it appropriate. 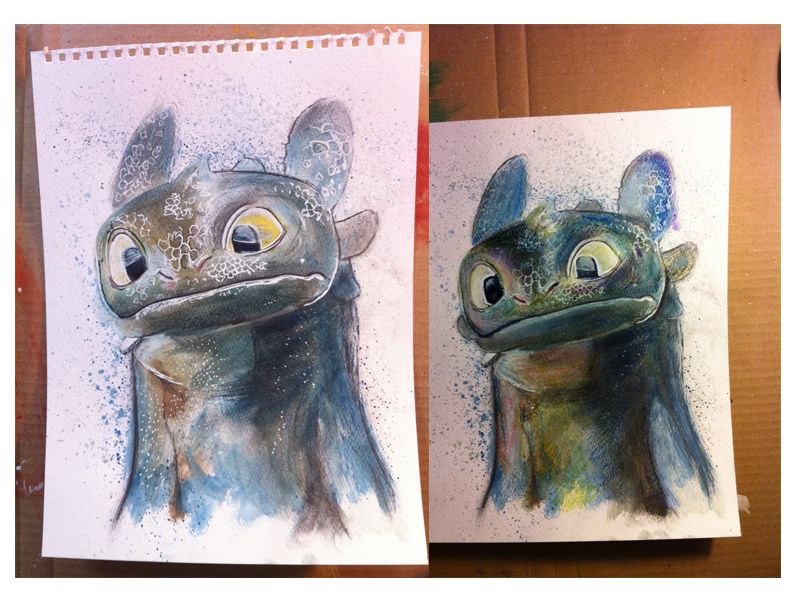 Below is some progression photographs of my artwork depicting ‘Toothless’, from Dreamworks ‘How to Train a Dragon’. As pointed out in my earlier comment, I did not begin with a sketch which renders your so-called ‘sketch’ utterly false. Applying a black and white filter, then adding charcoal and a sponge is the most pathetic way of adding validity to you work and looks so out of place I can’t imagine what possessed you to post this on instagram. For future reference with initial sketches it is all but pointless to add shading, as then you need to apply paint and it is almost impossible to have identical tones afterward. 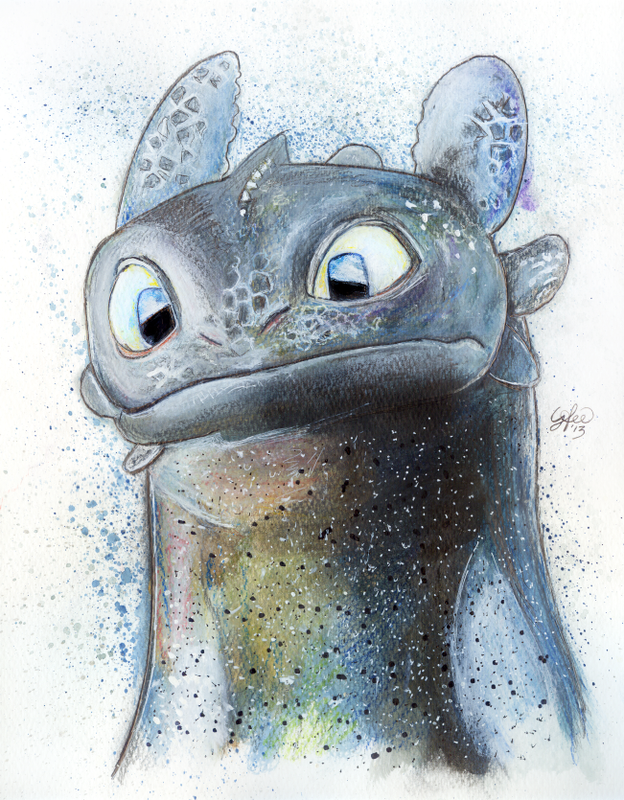 The image is one of many renditions of Toothless where I strived to encapsulate the character’s ‘colourful’ personality. Admittedly many of these attempts were awful, but in this particular artwork I saw promise as I began to add garish shades – challenging myself to tone them down but retain a suggestion of these colours at the same time. As important with all of my cartoon pieces, the background was important in so much as it felt messy and not irrelevant to the overall piece. You removed the background inexpertly and ruined this effect, likely hell bent on removing my signature. Then you decided to add your own revolting signature randomly over my Toothless and ruined the composition entirely. Furthermore I wished to analyse the work you didn’t steal but continue to lie about. As improvements in digital art progress it is very difficult to distinguish between originality and blatant fraud, but as with many untalented artists, the art you claim is ‘original’ is nothing more than a smudged and overpainted image done in Photoshop. If you were a talented artist you would not steal from others. From this I must question every artwork you have ever claimed to have done. After issuing my threat which you foolishly decided to force to come to fruition, I label you a coward, a fraud and a thief. I will of course welcome any answer or defence, though I suspect you will ignore this and run like the coward you are. This entry was posted in Uncategorized and tagged art, artwork, etsy, foxyartisan, fraud, original, ORIGINAL artwork, painting, redbubble, steal, stealing, stolen, theif, toothless. Bookmark the permalink.